Books – This is an easy and inexpensive alternative, but the major problem is that most children find reading boring. Taking time during the formative years in cultivating a love of reading in the child can help him tremendously in the long run. Reading stories with your child can teach him that books are fun and exciting, a portal into another world. Parents can set the example by frequently reading books themselves and designating time after school to be used solely for reading. Children hold their parents in high regard and frequently emulate the activities they see them doing. To further motivate children, parents can take them to the bookstore at least once a month and allow them to pick any book they want. There are plenty of children’s books that cover a wide genre of topics, such as horror, fantasy, and adventure. Different children have different tastes, and allowing them to choose their own books will kindle their reading desire. As mentioned earlier, 90 percent of school achievement is partly because of reading at home, and by developing a love of reading, huge successes at school will also be met. Sports – Children usually spend too much time watching TV in order to satiate their boredom. Introducing children to sports can eliminate the need for excess TV. Basketball, baseball, football, or even the martial arts can be highly appealing to children. Allowing your child to choose the sport he likes will further increase their interest. Sports can have tremendous benefits in developing physical strength, coordination, and teamwork, thereby giving your child a head start in life. Using sports as a family activity can also increase bonding among its members. Musical instruments – Fostering a love of music and teaching children to play a musical instrument can curtail too much TV watching, but the benefits don’t stop there: playing an instrument can have a monumental impact in creativity development. Parents can begin the process by showing their child videos of various instruments being played by professionals. There are plenty of these videos being posted for free viewing on the internet. Children are very impressionable, and witnessing such a magnificent spectacle will set off an internal desire to achieve the same feat. After a thoughtful discussion, the parent can allow their child to choose the instrument he likes, as long as it is within their budget. It is important that children choose instruments themselves. Otherwise children will quickly lose interest and justify quitting by saying it was not the instrument they wanted. When this happens, positive reinforcement and constant reminders of the benefits and success he will have can help him keep his motivation up. If working on a limited budget, renting or borrowing the instrument will suffice. If the parent has musical talent, he can teach the child himself which will save money and create an opportunity to bond! Hobbies – Watching TV is too passive a form of creative exercise. It would be wiser to introduce the child to hobbies that promote growth and development. Hobbies can include a stamp or coin collection, creative writing and storytelling, flower arranging, painting, photography, or even playing toys alone or with other children. All of these are better alternatives to watching TV and can teach children the joys of engaging the world, as opposed to the idle boredom of flaccid entertainment. Setting a schedule can put a stop to excess TV watching. Parents can sit down with their child and map out a schedule, making sure to set a realistic timetable that takes into account their child’s entertainment needs as well as his study time. Allowing your child to contribute in making the schedule can further improve compliance. After the schedule has been made, it should be posted in plain view in front of the TV. The schedule should be strictly adhered to during the coming weeks, since the child may attempt to get around it through bargaining. It is important to be resolute, because if the parent is easily manipulated, trust and respect is lost. After months of regular use, children can be allowed to manage his own time, and the schedule can be taken down. Hopefully, the habits learned during the supervised period will be ingrained and automatically followed. In this method, complete trust is placed on your child and his ability to manage himself. The amount of will and determination to succeed in school and the desire for self-improvement will usually surface if this technique is used. The child is given freedom, within reasonable limits, as to the amount of time he spends watching TV. This can be empowering to most children, giving them greater freedom and trust in themselves. Some will exploit this opportunity and subsequently get poor marks in school. When this happens, parents must allow their child to face-up to the consequences, whether it means attending a tutoring class, making extra credit assignments, or in a worst case scenario, repeating a grade. This can be a major turning point in the mindset of hard-to-manage children. When they experience bad results because of their own actions and know that the responsibility of cleaning up the mess is entirely their own, they will begin to experience an internal desire for positive change that will carry on throughout their lives. TV time can be made into a family social activity. Setting time every week, such as Saturday night, in which the entire family watches TV together can be a great way to bond. Watching TV with loved ones becomes a wonderful shared experience, sharply contrasting to the dull loneliness felt when watching TV alone. This method also gives children a weekly family bonding time to look forward to during the long school days, and makes solo TV watching less appealing. There are various softwares and products on the market that can auto-regulate the TV and shut it off when a certain time limit is met, thus saving parents tremendous time and effort from manual regulation. Some products use a token system, similar to an arcade game, in which the child inserts a token whenever he wants to watch TV. The token activates the TV, and after a set amount of time, automatically shuts it off. Another token would then be needed to turn it back on. Parents can then decide to give the child a set amount of tokens per week. This places the responsibility of using the tokens accordingly in the child’s hands and teaches him the value of proper budgeting. These products can be very efficient and clear-cut, limiting the chances of the child watching TV behind the parents back. The downside is the expense: some products go up to more than 100 dollars, but the average is about 50 to 60 dollars. If the parents can afford it, it would be a worthwhile investment. A more primitive, but nonetheless effective, solution would be to disconnect the cable or TV signal during times when TV viewing is not allowed. With modern screens and cable providers available, parents can easily figure out how to temporarily disable the signal without their child having the ability to turn it back on. The downside to this method is the possibility of creating negative emotions between children and parents. Children might feel that he is not trustworthy enough to be left alone with the TV. However, the advantage of disconnecting is that he would have to find more productive forms of entertainment, such as reading books or socializing with friends. 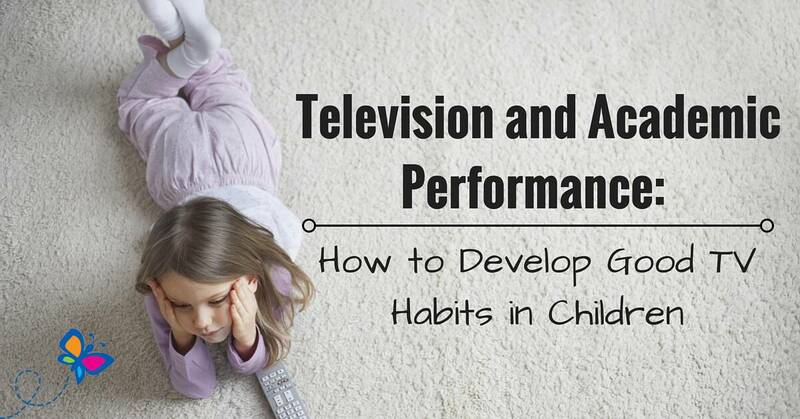 Television can have a profound effect on growth and development during the formative years. Developing good TV habits will improve relationships with friends, academic performance, and overall wellbeing. It is up to the parent to help their children control their academic and social future by teaching them how to use the TV in moderation. It is one habit that we should not take lightly. Our children’s future depends on it.